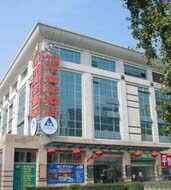 Beijing City Central Hostel is located at the corner of Beijingzhanjie and Beijingzhan Xijie, right across from the Central Railway Station. Bus terminal, airport shuttle bus stop and taxi stands are next to the railway station, and Beijingzhan subway station is just outside the door. 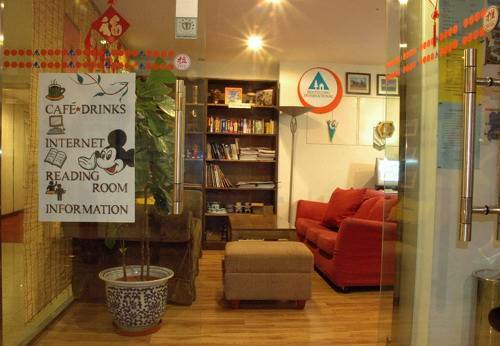 This is the largest hostel in Beijing, with central air conditioning and individual controls in each of the 200 rooms. 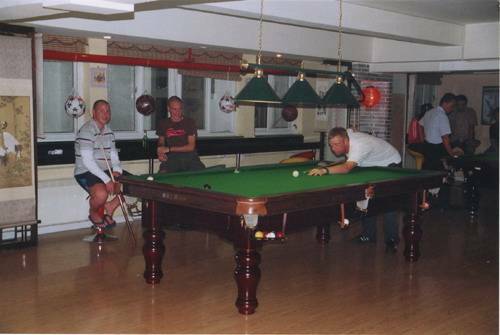 It offers a computer/internet room, billiards, bar, and karaoke with jukebox. On the 1st and 2nd levels are a 24-hour supermarket, breakfast bar, coffee lounge, ATM, IC/IP phones, express film processing, mobile phone shop, and post office. The guest rooms on the 3rd to 6th floors include ensuites, doubles, singles, and 4 and 8 bunk dormitories. Around the nearby Henderson Center are fast foods such as Kentucky Fried Chicken, McDonalds, Subway, Starbucks, Pizza & Cafe. Inside you can find department stores, fashion boutiques, jewelry shops, hair stylists and beauty salon, and men's fashion and sports wear shops. In the vicinity are medical clinics, dental care, massage salons, pharmacies, eyeglass shops, bookstores, and souvenir shops. The hostel is next to the central business district that contains many gourmet kitchens serving diverse national and ethnic delicacies. ATM facilities can be found in the many nearby banks along Jianguomennei Dajie. Tian'anmen, Forbidden City, Tiantan, Observatory Museum, Nanhai, Zhongshan Park, and Wangfujing Dajie shopping street are all located a short ride from the hostel. - Double (two-single beds) rooms, some with Internet and bathrooms. 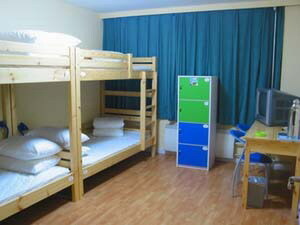 - 4 and 8 bunk dormitory rooms with lockers, linen & duvet provided. - 2 and 4 bed dormitory rooms with lockers, linen & duvet provided. - Single (one-person bed) rooms, linen & duvet provided. - Tourist information - organized tours to the Great Wall and other Beijing attractions. Our information booth has information on cultural entertainment such as folk dances, Chinese orchestra performances, kung fu demonstrations, traditional ceremonies, Chinese opera, folk song performances, etc. - We can arrange acrobatic shows, art gallery visits, ikebana classes, calligraphy classes, Chinese painting and cooking classes, and many other activities for groups. Walking on the Great Wall from Jinshanling to Simatai. The structure of Jinshanling was mainly built in 1570 of Ming Dynasty and it was a well-preserved fortification system as well as natural fantastic scenery. Simatai Great Wall is highly recommended by the publication Lonely Planet. 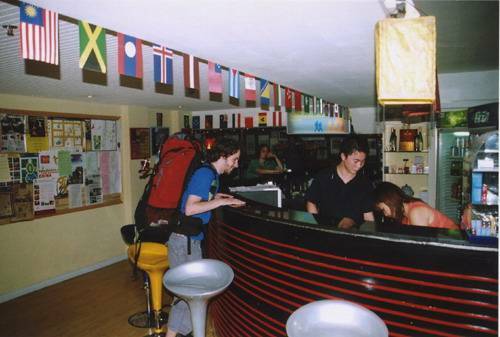 The hostel organizes daily tours for you to walk on the Great Wall from Jinshanling to Simatai. Along the way you will enjoy the beautiful scenery and you will bring home many pleasant memories, the cost of 90 RMB includes transportation only. Tours also available to the Badaling and Ming Tombs the price of 180 RNB includes transportation, all fees, lunch and English guide. The Summer Place tour includes tours to the Temple of Heaven, Forbidden City, Tian'an men Square along with the Summer palace included for 230 RMB are; transportation, all fees, guide, and lunch. Beijing Opera at Liyuan Theatre, with its traditional setting is on regular live performances either English subtitles everyday. Acrobatics at Wansheng Theatre is first-class acrobatic show given by the Beijing Acrobatic Troupe, which was founded in 1957.. Arriving by air: please take the "C" line of the Capital Airport shuttle bus. The shuttle bus stop is located a short distance to the right outside of the main entrance of the arrival building. Get off at the Beijing railway station. We can arrange pick up service from Airport to the Hostel. It costs 120RMB per car with max. 3 people from 7:00am to 7:00pm. For other times it costs 150RMB. The above rate includes high way toll and parking fee. if you want us to pick you up from the airport, please let us know in advance the flight number and arrive time by email. Arriving by train (Beijing Main station): the hostel is at the northwest corner of the station square. Arriving by train (Beijing West station): take bus 703 to Beijing Main Railway Station. - Bus 208 (night bus from 11:20pm to 4:40am) serves Beijing Railway Station, Gongti, Tiantan, etc. 2 and 4 bed dormitory rooms with lockers, linen & duvet p24-hour hot waterrovided. It's very easy from airport to Beijing City Central Youth Hostel, when you arrived the airport, out of the arrived entrance, then turn right walking about 50 meter, you will be find the airport shuttle bus station, take airport shuttle bus "No. 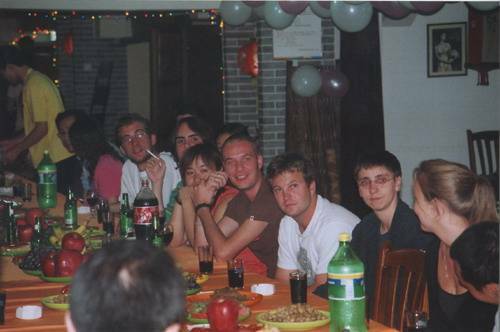 3" line from airport to Beijng Zhan (terminal stop), then walking along the street to the Beijing Zhan Station Square, you will be find the hostel located the northwest corner of the station square(opposite the station square), there have big sign Beijing City Central Youth Hostel. the shuttle bus fee is 16RMB/per person.